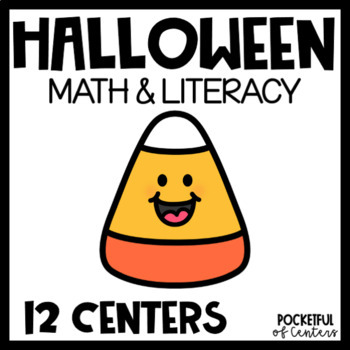 This BUNDLE of Halloween Math and Literacy Centers for Pre-K and Kindergarten is packed with hands on centers for October!! 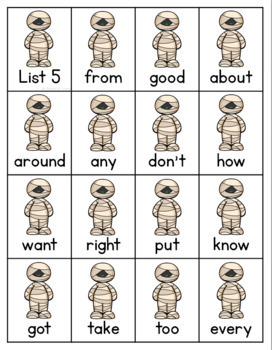 PLUS a freebie: Halloween Sight Words! Skills include letter recognition, beginning sounds, rhyming, sight words, number recognition, counting and shapes. Halloween Letter Bingo Halloween Letter Bingo is a fun way to practice uppercase and lowercase letter recognition. BOO! Letter Recognition Game This is a fun letter recognition game to play in October and for Halloween! Play this game as a whole group or small group game. It can be easily modified for students of all abilities. Halloween I Have, Who Has Letter Recognition Game This Halloween circle time game is a fun way to learn letters in October! There is a set of uppercase letters and a set of lowercase letters. You can easily modify this game to fit the needs of your students. Halloween Beginning Sounds Match Learn letters and beginning sounds with this Halloween Letter Match game! This game can be played like the traditional "Memory" game. You can also use the cards during circle time and have the children place the matching beginning sound cards next to each other on the pocket chart . . . and then keep it in the Pocket Chart Center! Halloween Rhymes This Halloween Rhyming Game for is great for October centers! Children will have fun sorting rhyming words with this fun Halloween themed activity. This set includes two sorting mats - "rhymes" and "does not rhyme" and 36 picture cards to sort. Halloween Count the Room This Halloween Count the Room activity is a fun math center for Pre-K and Kindergarten. Print the 12 Halloween themed picture cards and hang them up in your room. Print the worksheet. Now have the children search the room, count the objects and write the amount on the worksheet! The objects to count are from 1-12. Halloween Counting Mats 0-20 This packet includes a spider web counting mat for the numbers 0-20 and a sheet of colorful spiders. Each mat includes the numeral and number word. When they are placed in order you will notice an AB pattern in the background! The children will use the spider counters (included - or use plastic spider rings) to count out the correct amount of spiders to place on each mat. 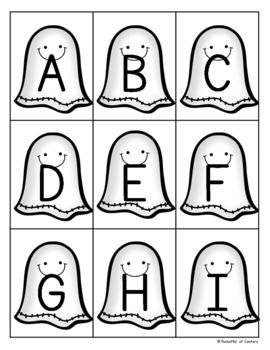 Halloween Ten Frames This Halloween center activity includes a "little ghost" themed ten frame game AND ten frames from 1-10. To play the game the children choose a spinner and add (or subtract) the candy corn until there are 10 candy corns on the ten frame. This activity can be played individually, with a partner or small group. There is also a set of ten frame mats labeled 1-10. These are great to add to a math center. 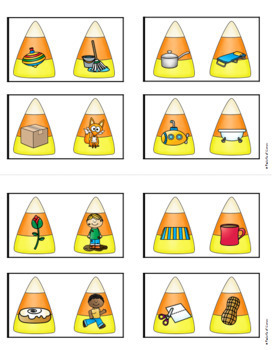 Place a container of candy corn (or use the ones provided) and the children place the correct amount on the ten frame. Halloween Cube Roll Math Game Celebrate Halloween with a fun math game that focuses on counting, graphing, and visual discrimination. The children will roll the die (included) and record the results on the graph. This game is different every time you play! Halloween Sight Word Game This Halloween Sight Word game is a fun circle time, small group or learning center game! It includes 220 sight words. This work station game includes 11 sets of sight word cards (220 cards), special cards (Black Cat!, Trick or Treat! and EEK! ), printable directions, and an optional review worksheet. Looking for more Holiday Centers?